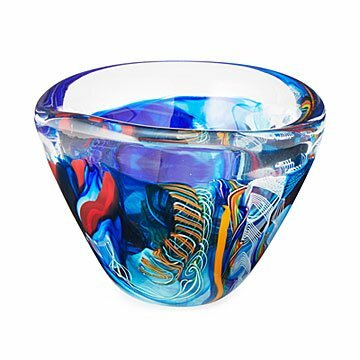 These stunning handcrafted bowls are inspired by candy making and classic glass marbles. Glass artists Carrie and Patrick Frost say that making their stunning marble bowls is "similar to making candy, but much hotter." We think Willy Wonka would be proud. Inspired by the swirled marbles of yesteryear, the Frosts take colorful glass canes and stretch, layer, and weave them into intricate patterns captured in clear glass. Through blowing and centrifugal force, this dramatic dance of molten glass is spun into a flat disk that they then shape by hand into a brilliant bowl. With their spontaneous interactions of color and form, each piece is a one-of-a-kind work of art and an heirloom in the making. Handmade in Mantua, Ohio. Carrie and Patrick Frost are the proud founders and makers behind Frost Glass. Their combined ambitions and passion have made Frost Glass an innovative company in glassware. Twenty-five years of combined experience in glass making has fueled the fire for the style and design of each Frost Glass creation. Carrie and Patrick design and execute these handmade works of art with the goal of enhancing your everyday experience and making occasions more memorable. Careful development and delivery goes into each design by the husband and wife team, who draw on experiences with masters from Italy, Czech Republic and the United States. In 2014 the culminated efforts of a seven year collaboration brought Carrie and Patrick the opportunity to set up Frost Glass headquarters and studio in Mantua, OH. Learn more about the process and inspiration behind the Frosts' glass creations in an interview with the couple on our blog, or go behind the scenes and check out our Studio Tour! Hand wash with a soft cloth and mild detergent. I have been trying to order another one, no success yet.